This vacation package hits all the top sights in the 49th state and provides ample time to explore in your compact rental car along the way. Prices include a compact car. During checkout you will have the ability to upgrade to a full-size car for $100 per car or a small SUV for $350 per car. Arrive in Anchorage, Alaska's largest city. We'll meet you at the airport and will transfer you to your Anchorage hotel, where you'll receive your copy of THE MILEPOST. Call the downtown Anchorage Avis office for a transfer to the car lot where you'll pick up your vehicle. The day is yours to explore all that is in and around Anchorage. 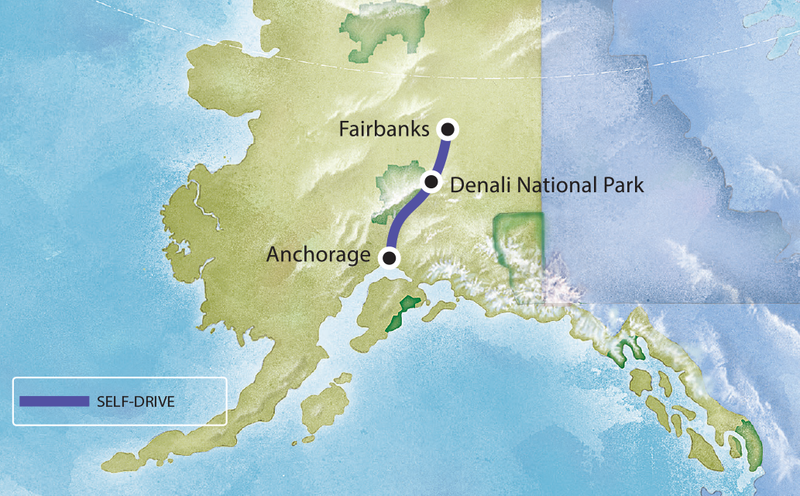 Consider a drive to the Kenai Peninsula. Mileage is unlimited! Overnight at your Anchorage hotel. Spend today venturing deep into Denali National Park on your included Tundra Wilderness Tour. Keep a lookout for wildlife along the way. Overnight at your Denali hotel. Today drive to the Riverboat Landing, where you'll enjoy your included lunch. After lunch, you'll take a trip on an authentic Sternwheeler, the Riverboat Discovery. Overnight at your Fairbanks hotel. Your tour ends when you drop your car off at the Fairbanks Airport Avis location.